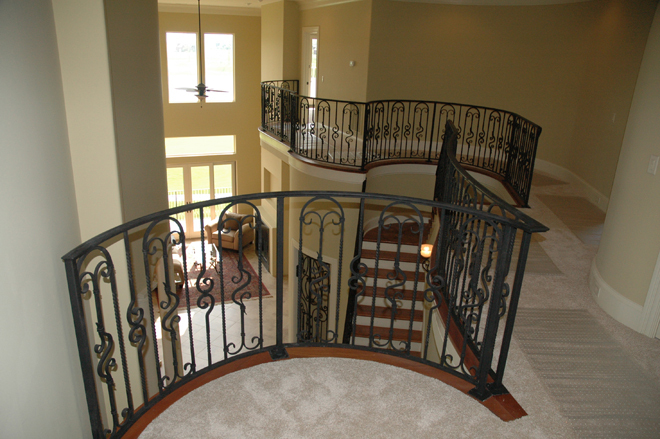 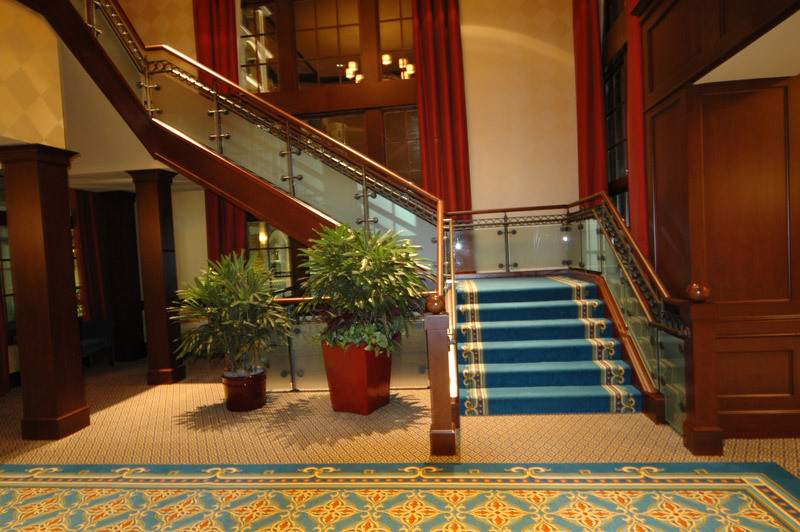 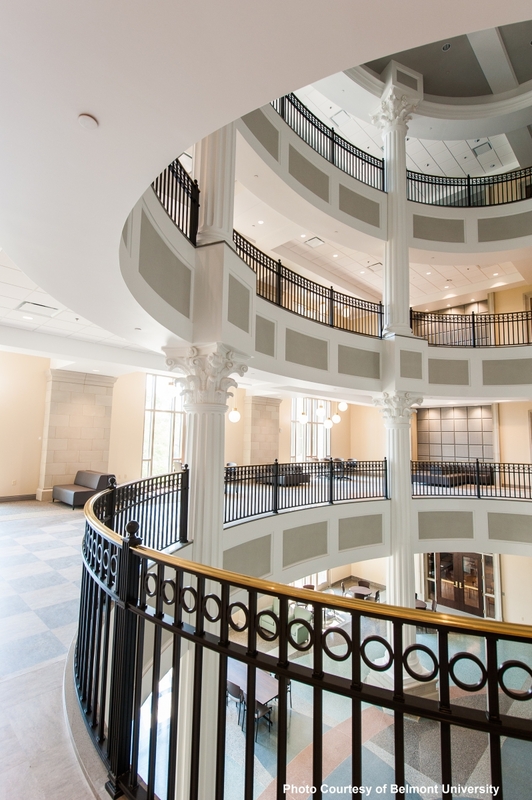 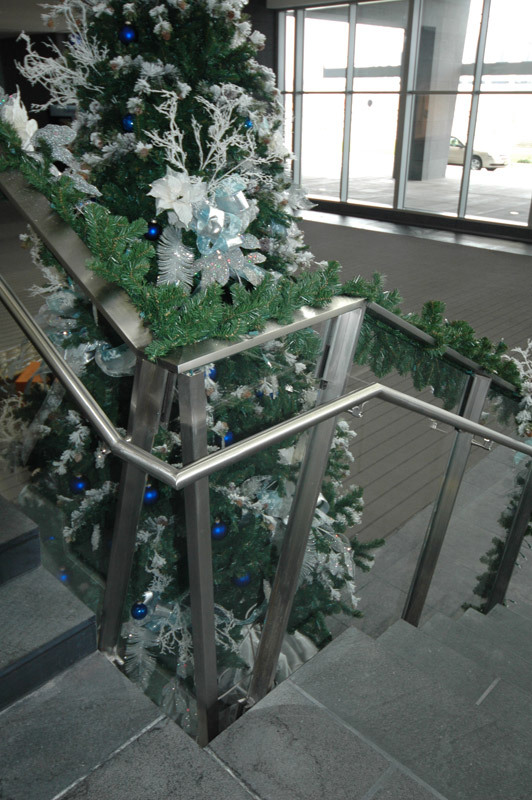 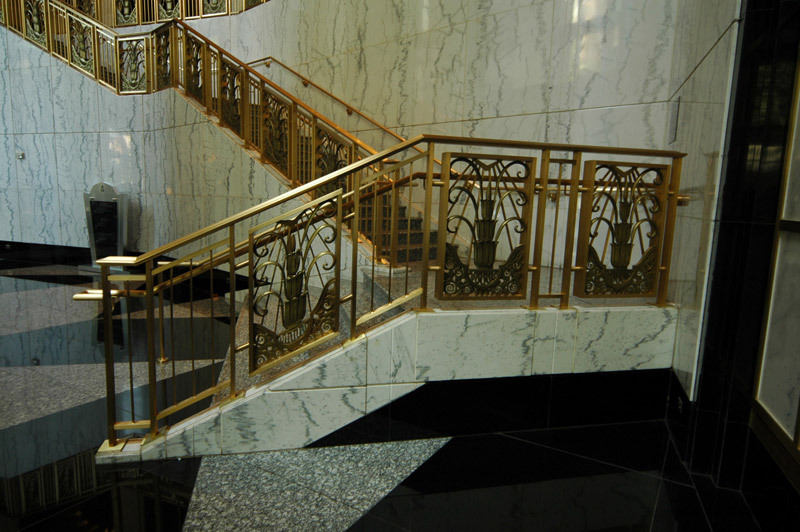 Ornamental Railings | Tate Ornamental, Inc.
Tate Ornamental, Inc. is a premier fabricator of custom ornamental handrail and guardrail systems. 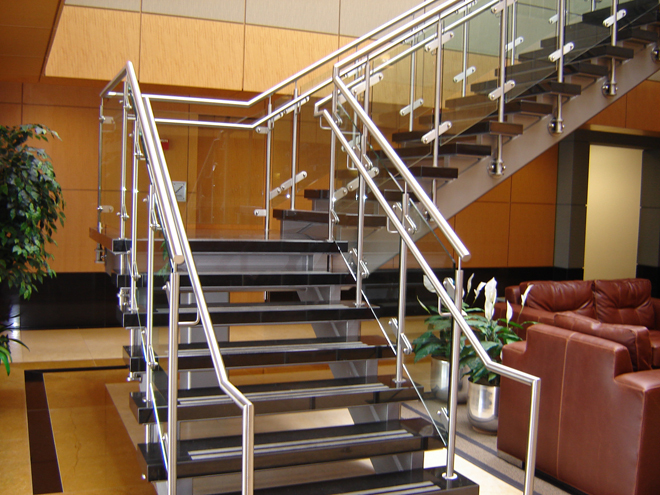 We pride ourselves on being able to take your design concepts and create one-of-a-kind pieces of art. 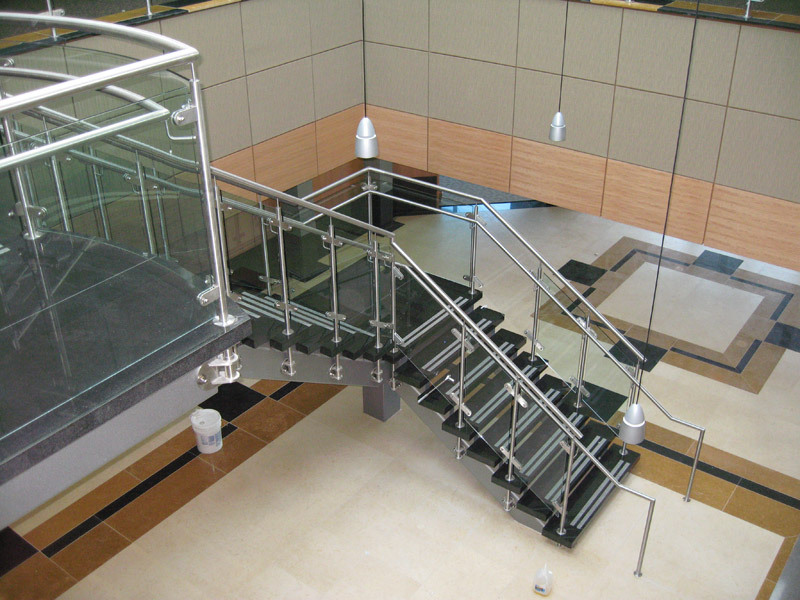 Our experience and expertise includes working on both small and large projects with different levels of sophistication. 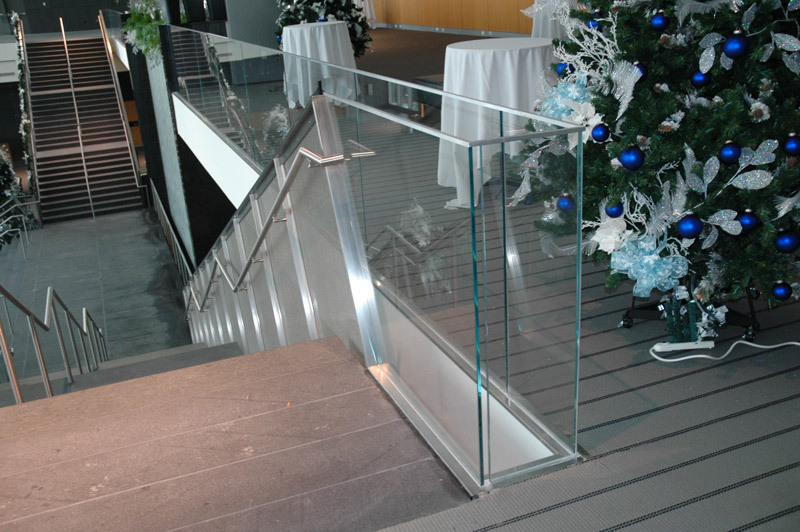 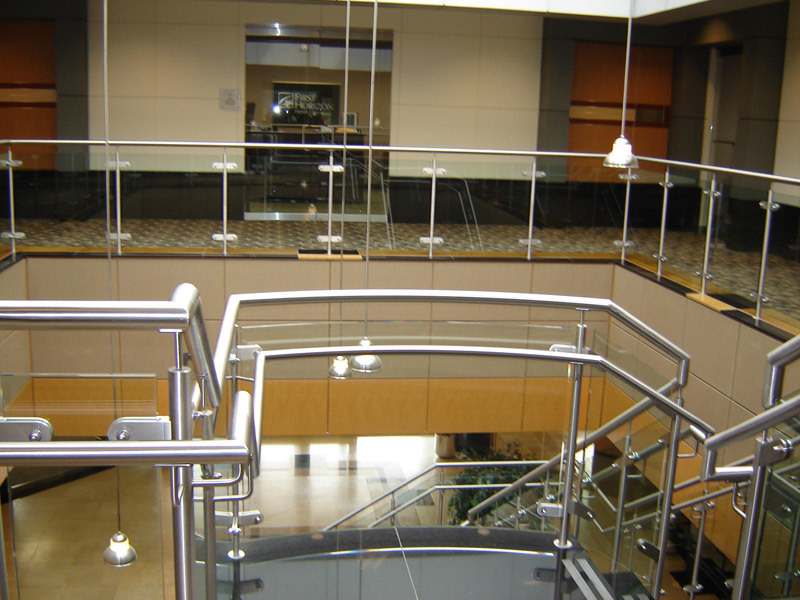 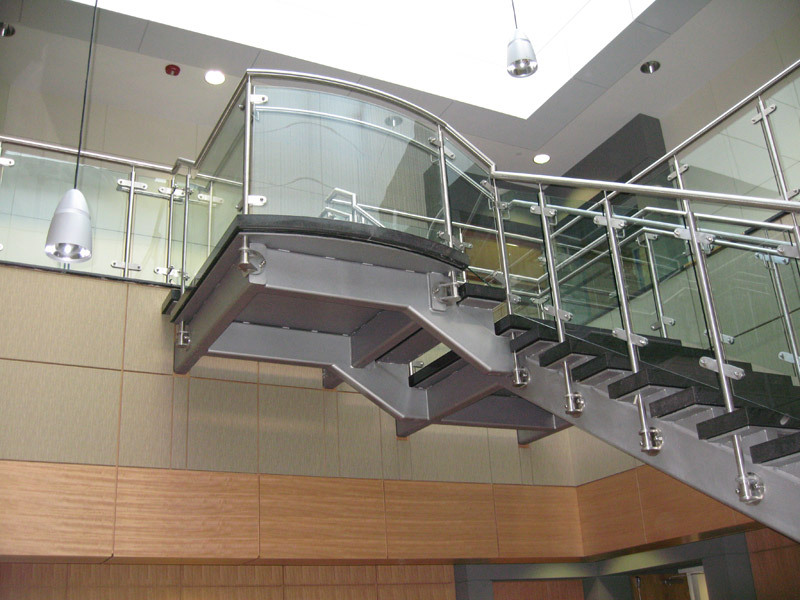 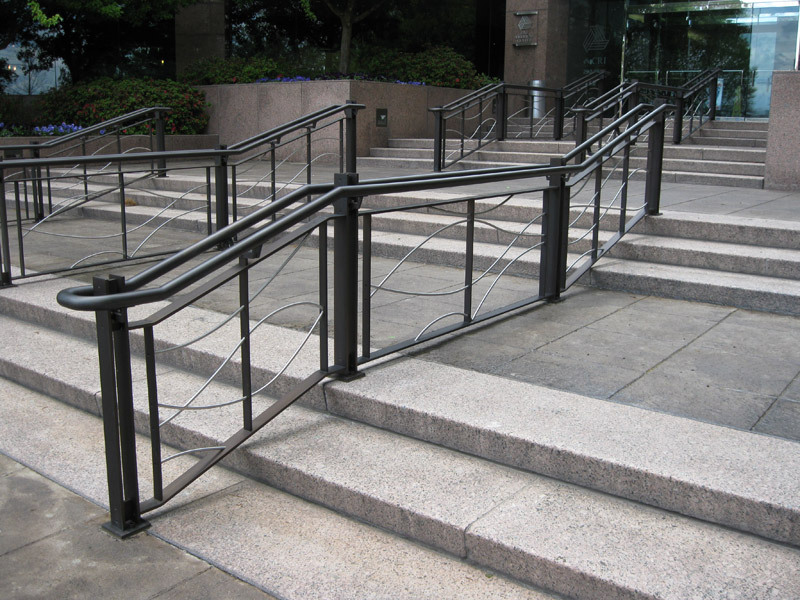 This handrail system consists of an aluminum receiver mounted to the stringer with a half-inch tempered glass infill panel capped off with a 3″ diameter wood top cap. 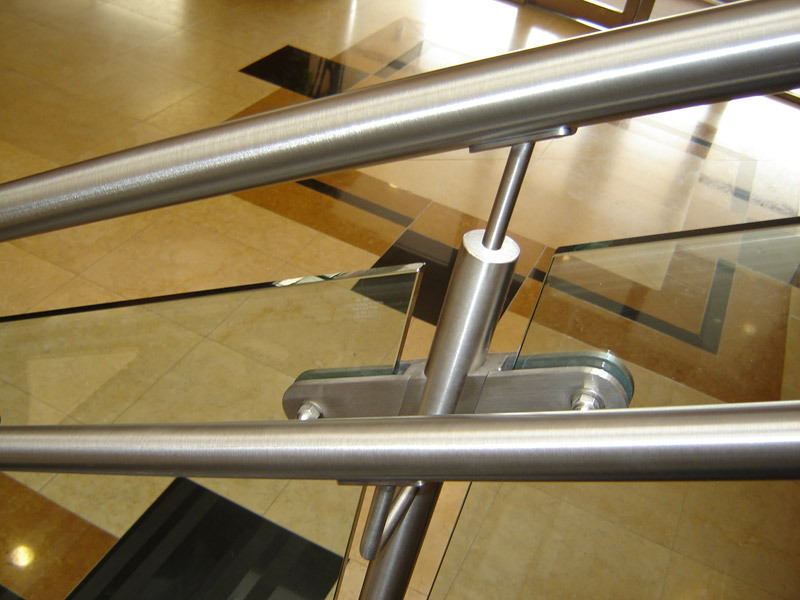 It also includes a stainless steel grab rail mounted to the glass with custom brackets. 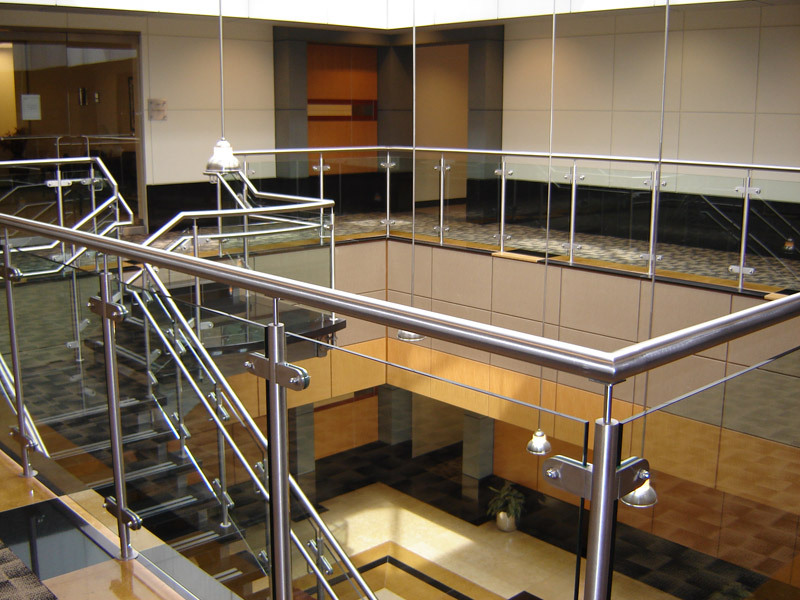 This post mounted glass rail system consists of half inch tempered glass being suspended from stainless steel posts by custom brackets. 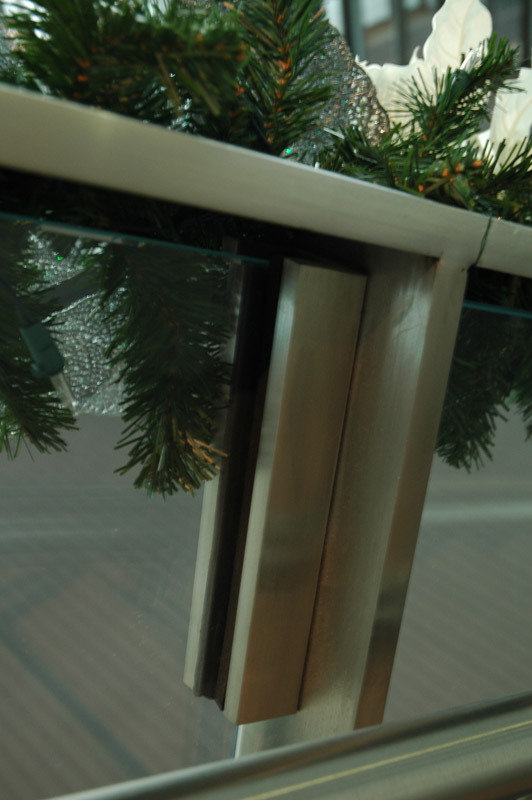 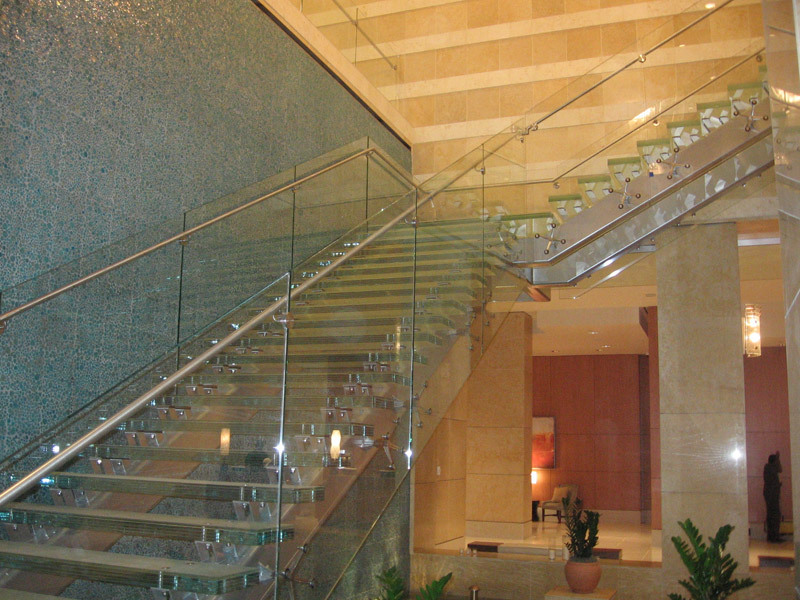 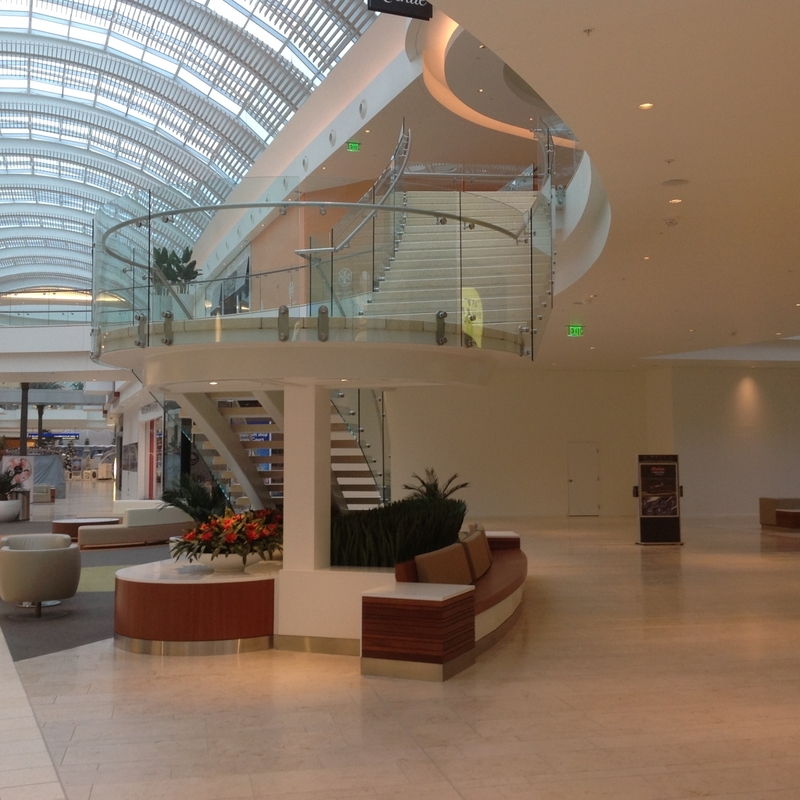 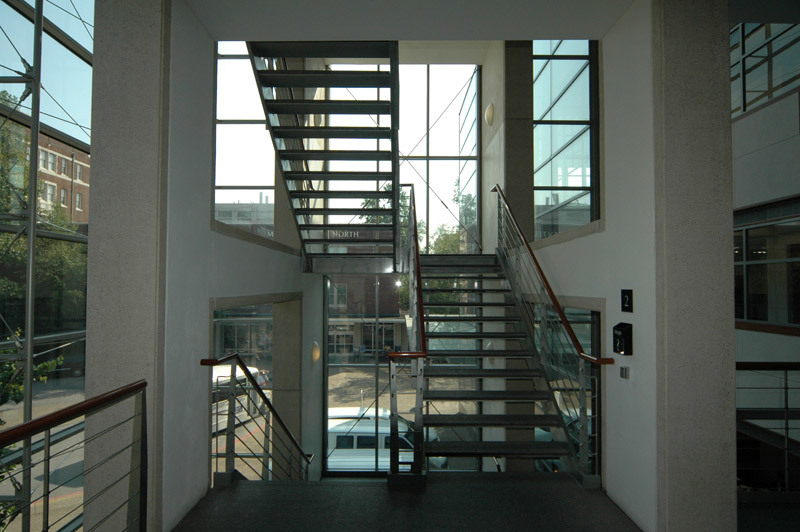 This handrail system allows the glass to be exposed on all four sides. 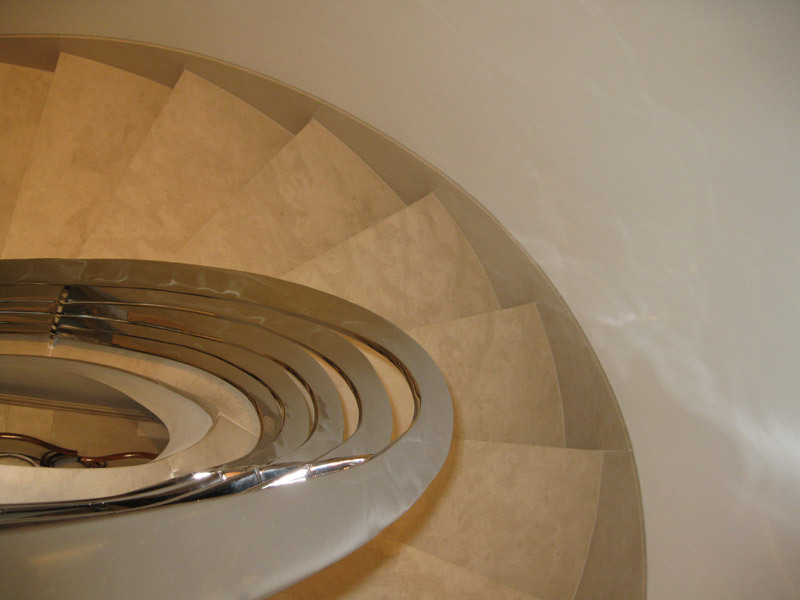 We fabricated the decorative stairs as well which features a radiused landing and granite treads along with a side mounted post attached to the stringer. 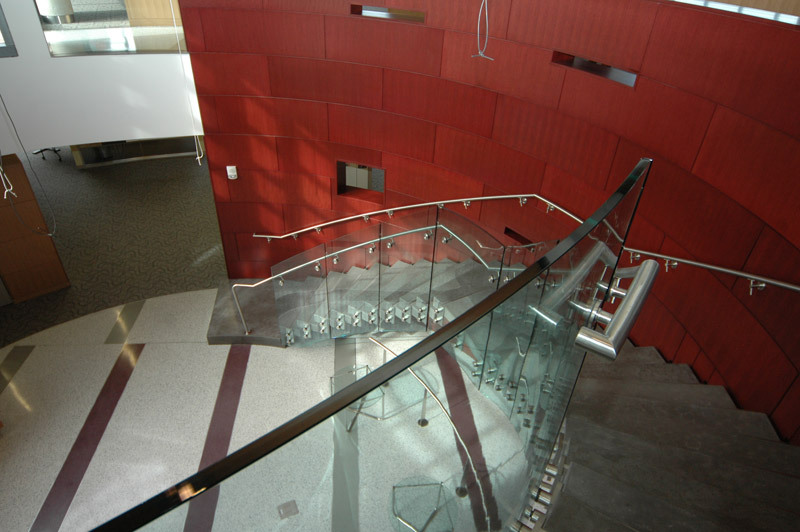 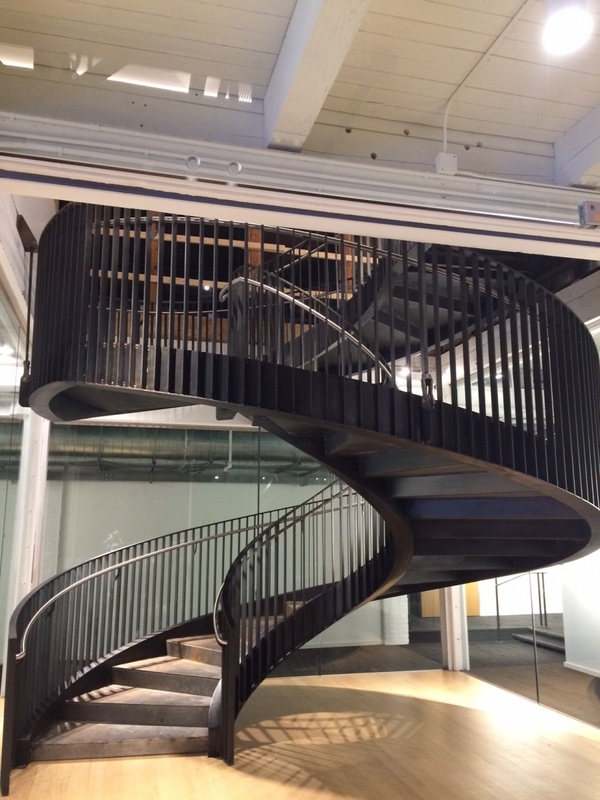 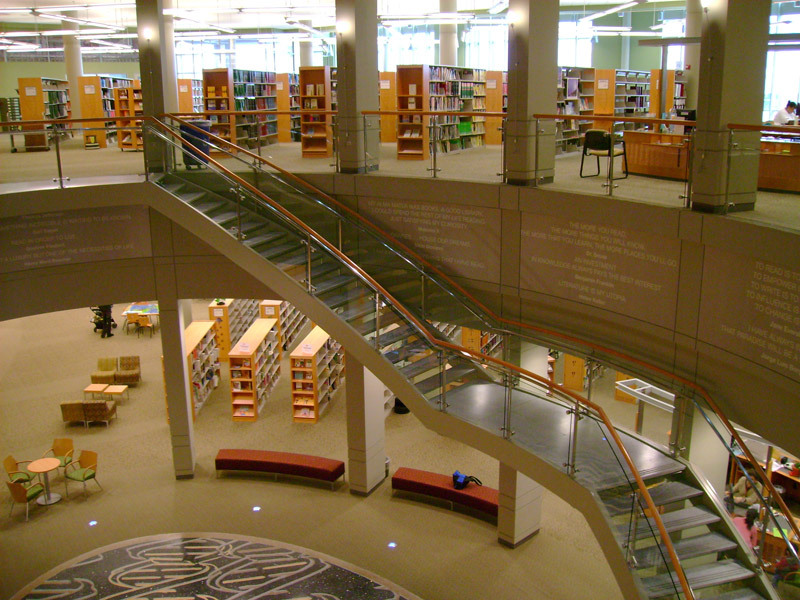 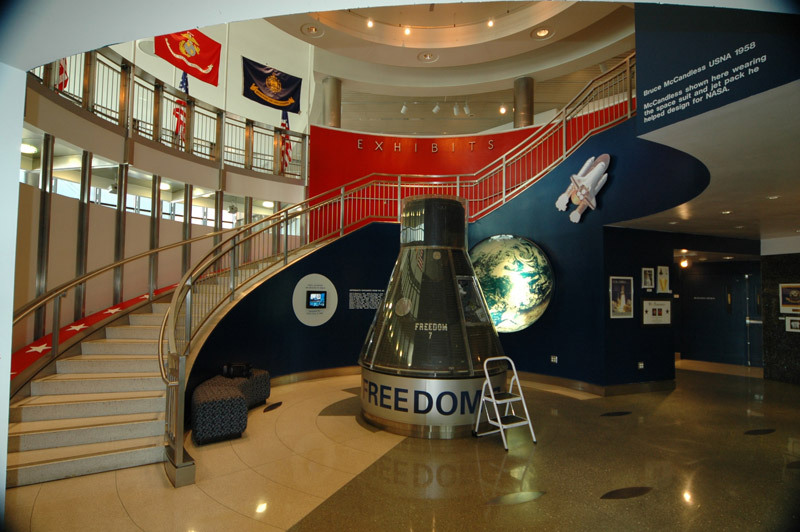 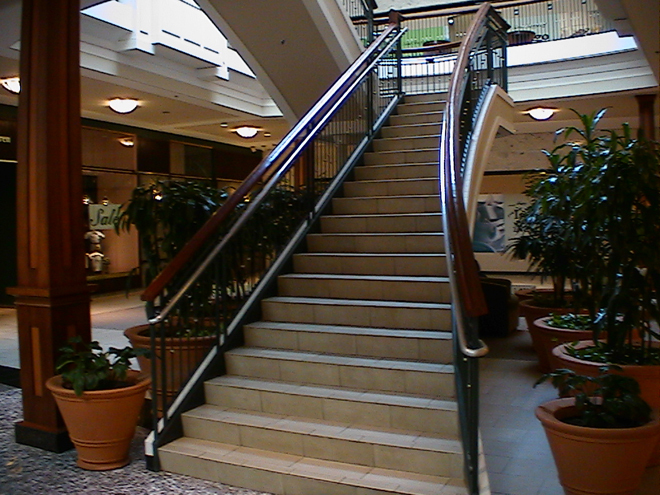 The top and bottom of the staircase is suspended and has open risers. 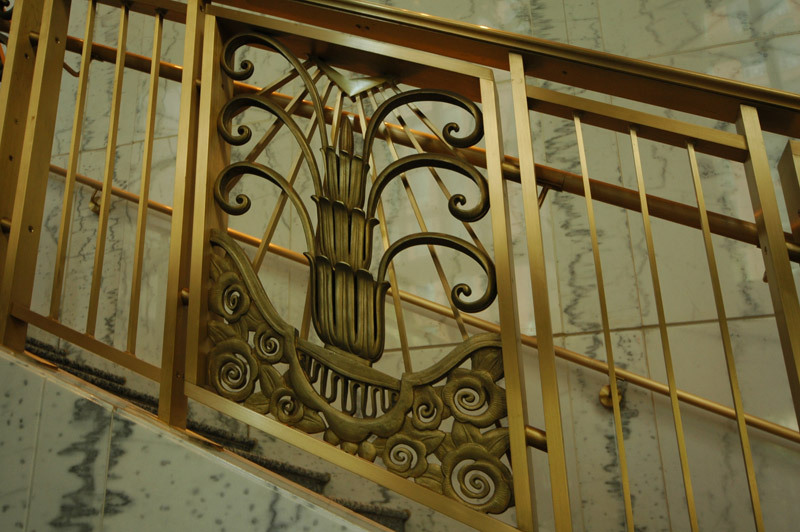 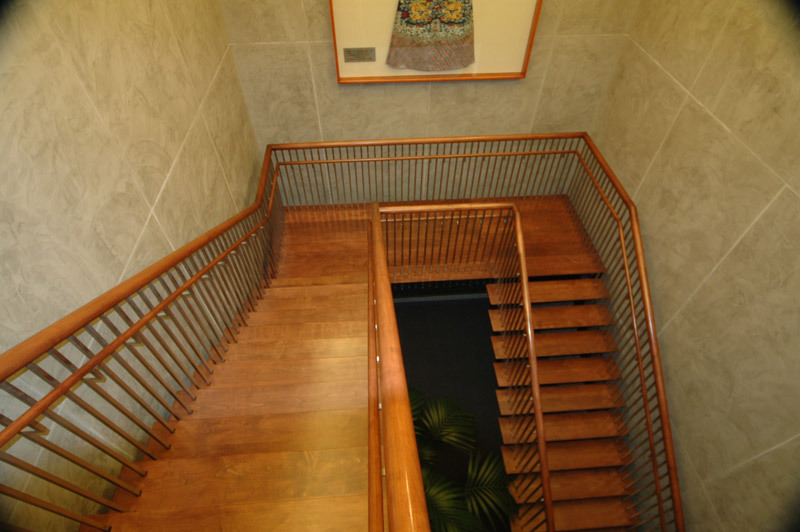 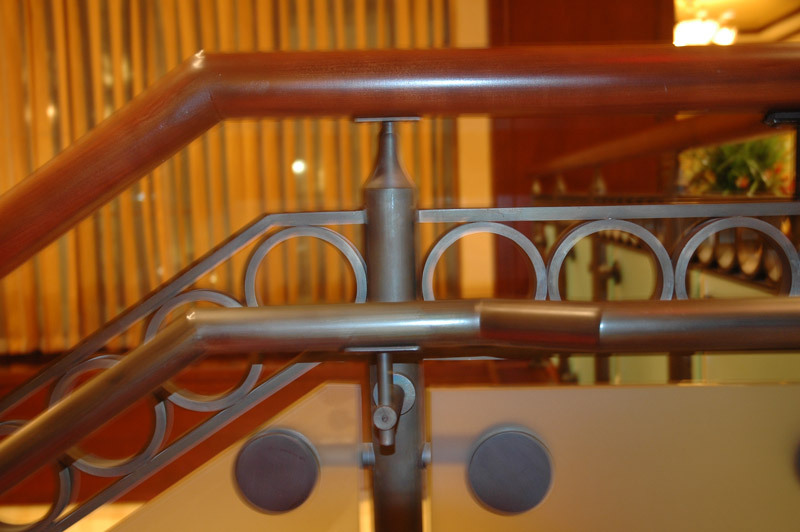 This is a solid bronze handrail system made from a solid bronze bar designed to fit around historical bronze castings preserved from a building in Europe designed by Mr. Gustave Eiffel, the designer of the Eiffel Tower. 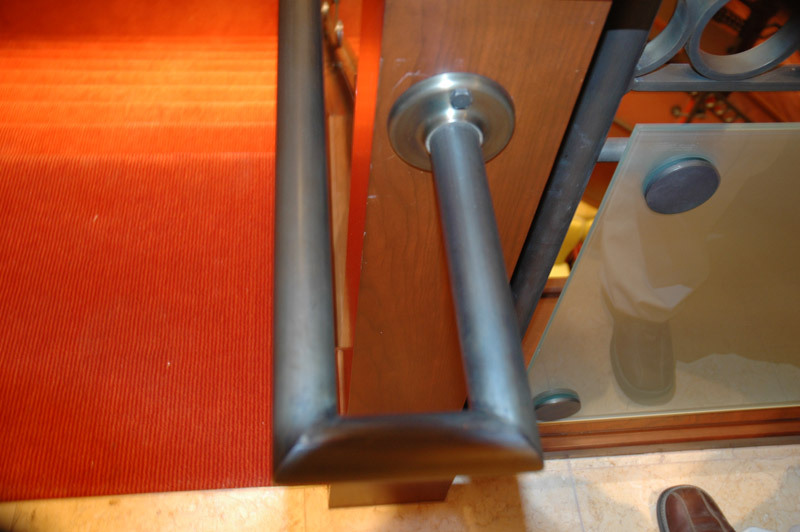 It also includes a custom extruded bronze top cap. 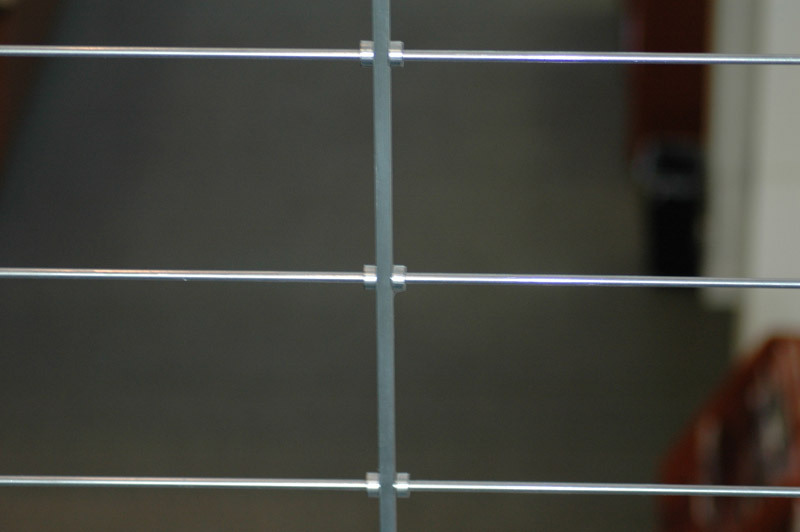 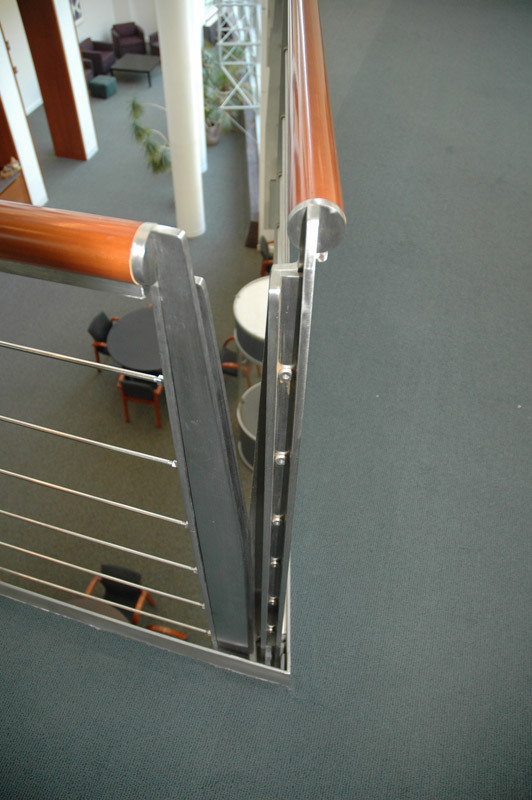 This rail has a #4 linear satin finish and is clear coated to preserve the design. 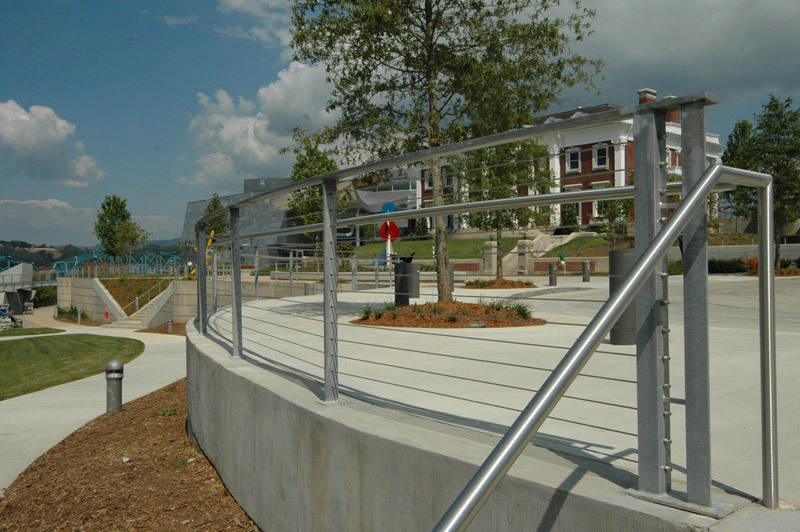 This project includes stainless steel posts and a horizontal steel rod for the rail in-fill. 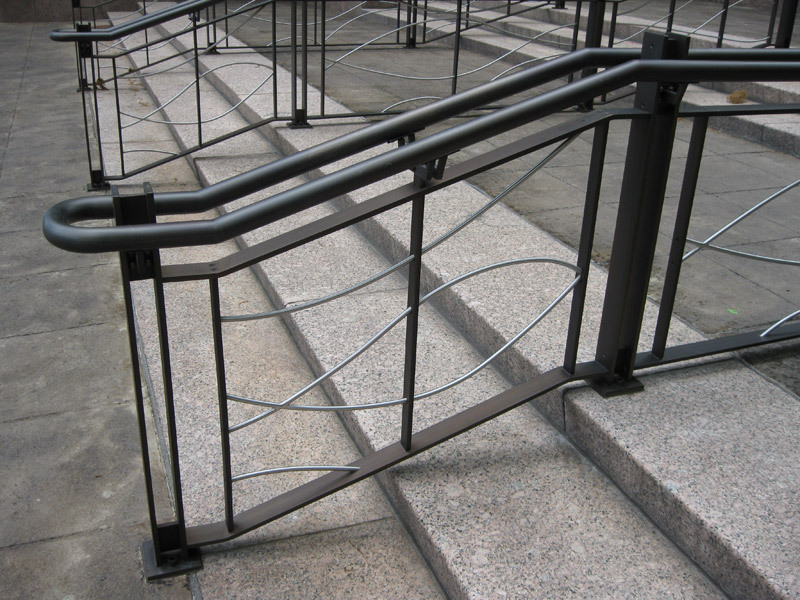 The rods could easily be replaced with stainless steel cable if desired. 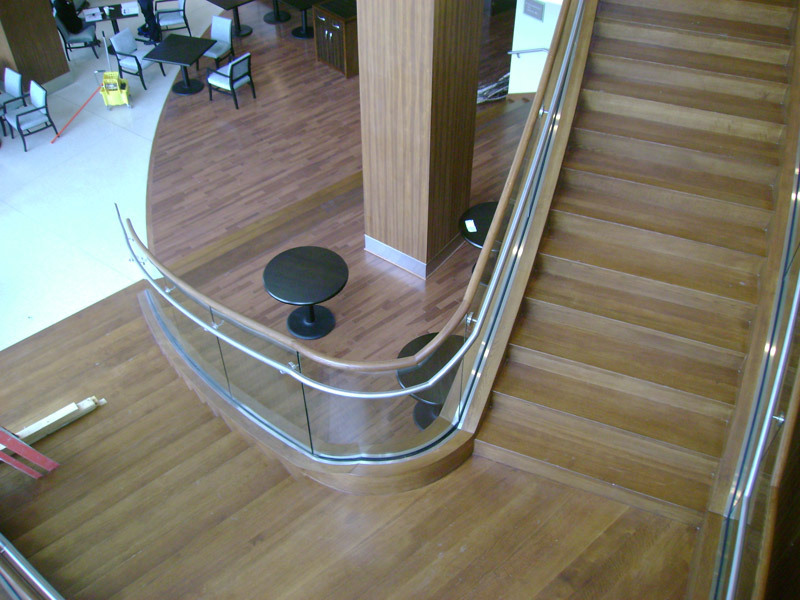 The rail system is capped off with a segmented wood top cap. 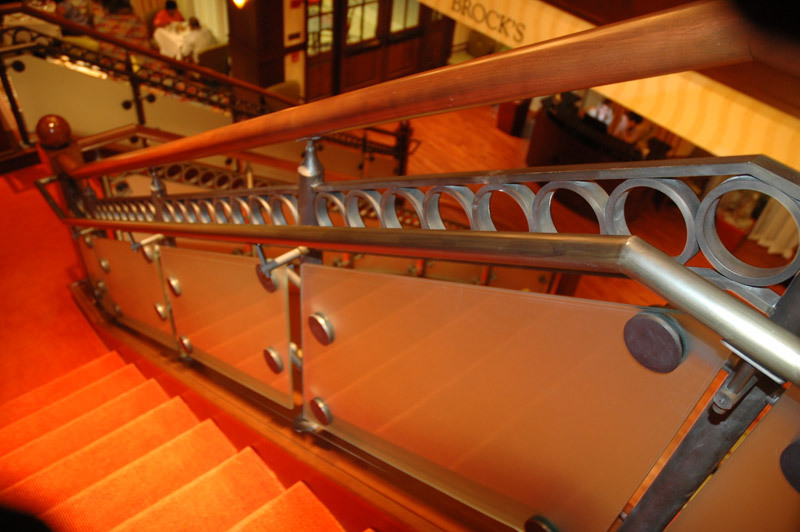 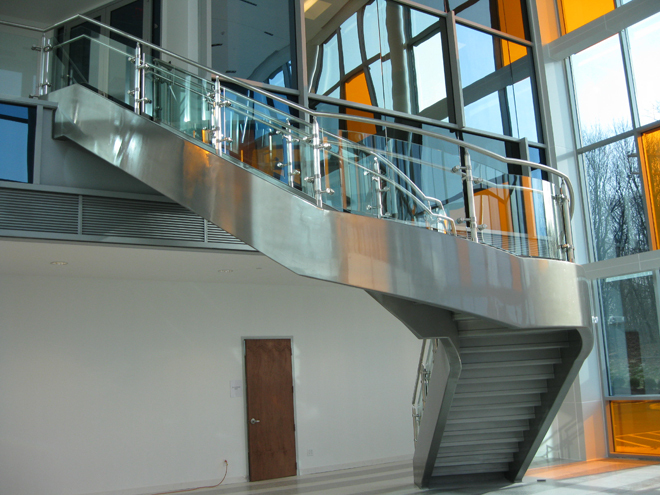 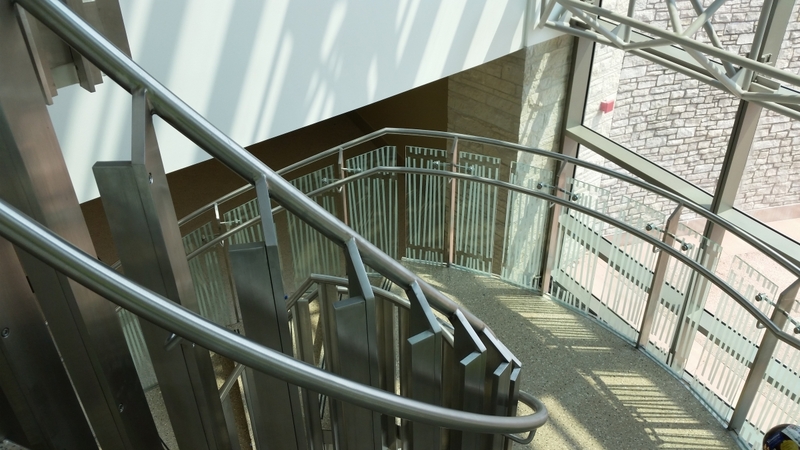 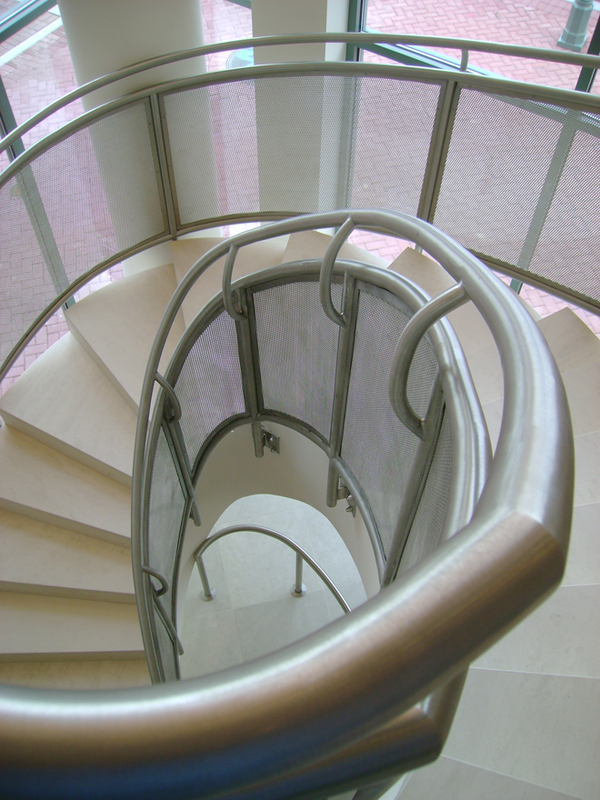 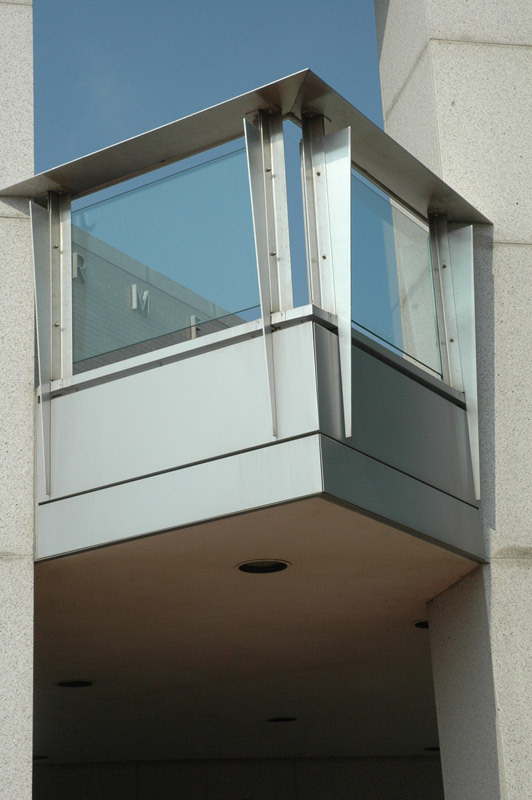 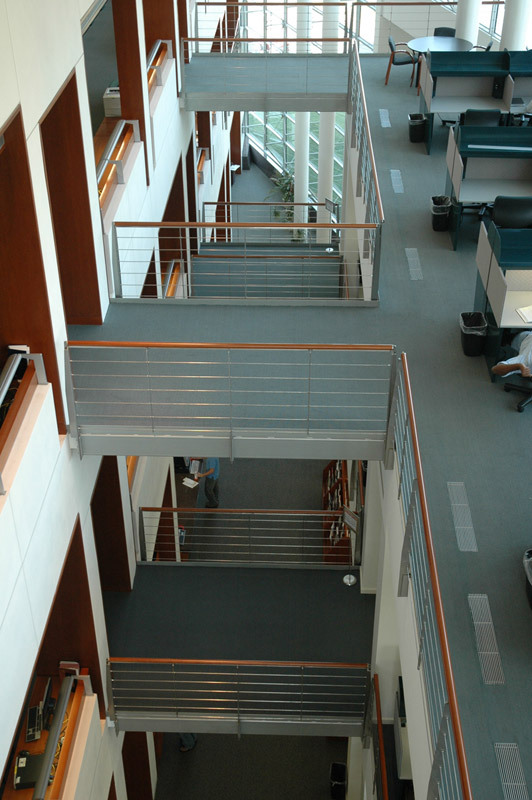 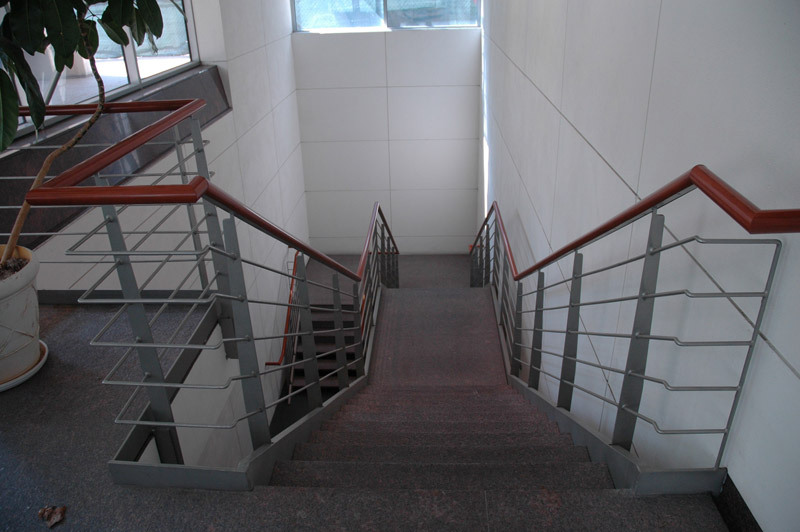 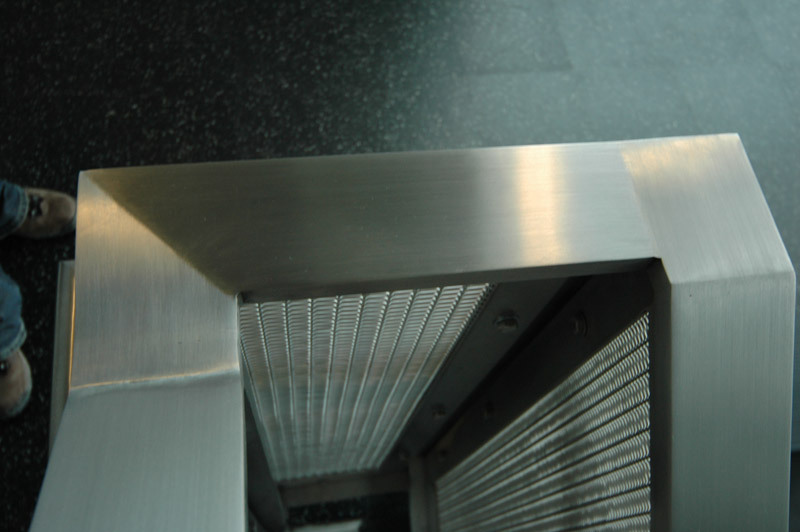 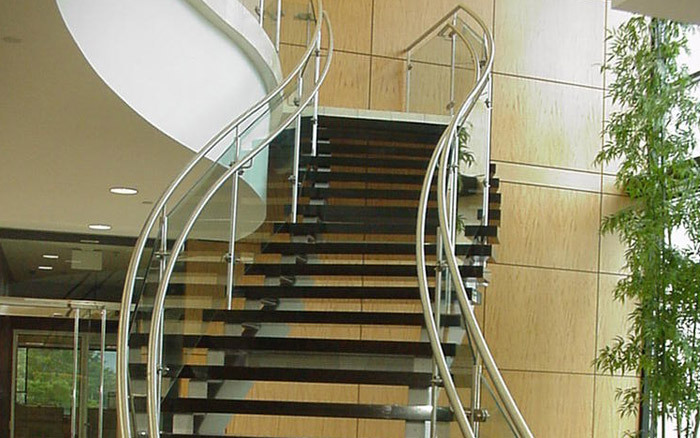 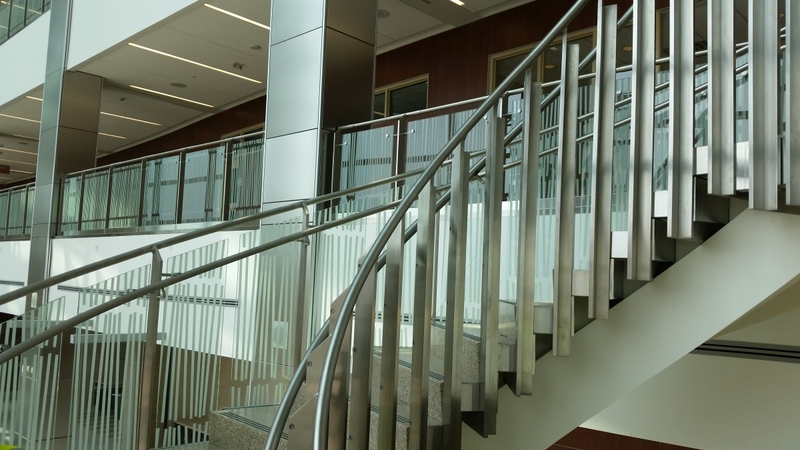 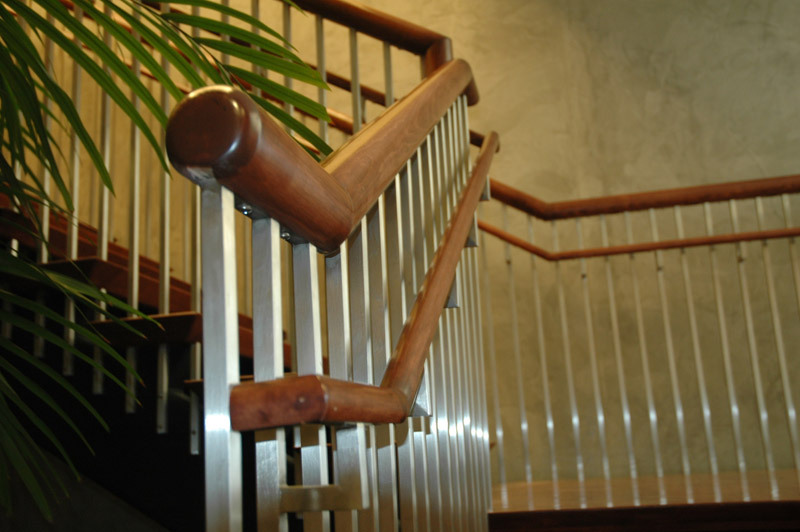 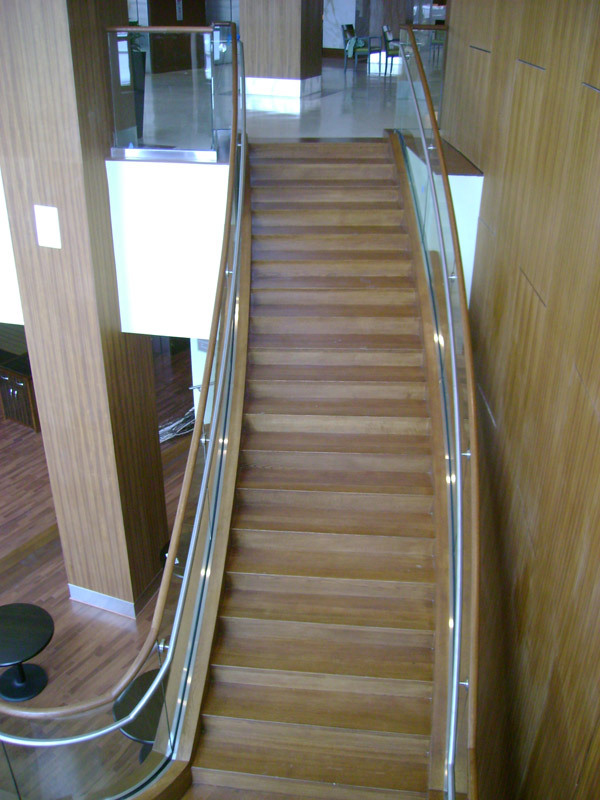 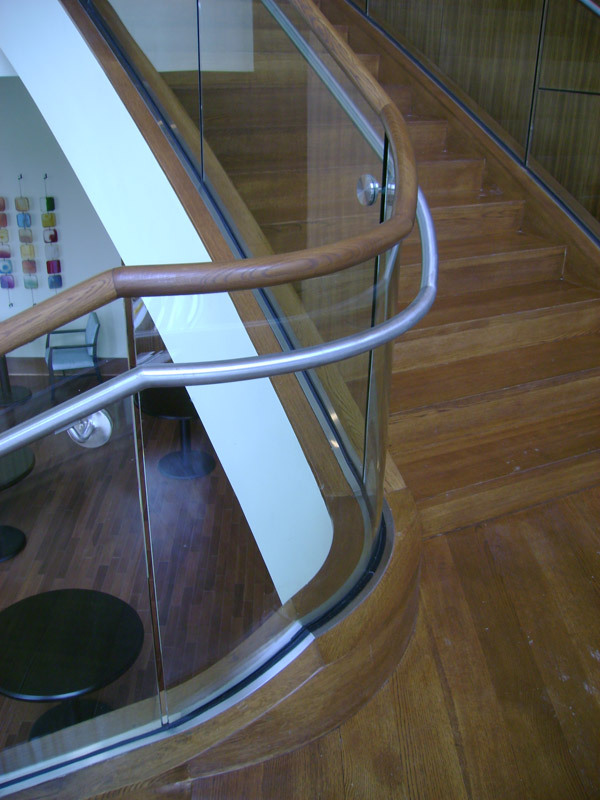 This rail was used on the stairs and balconies, and it should be noted that the stainless steel portion of this handrail system is maintenance free. 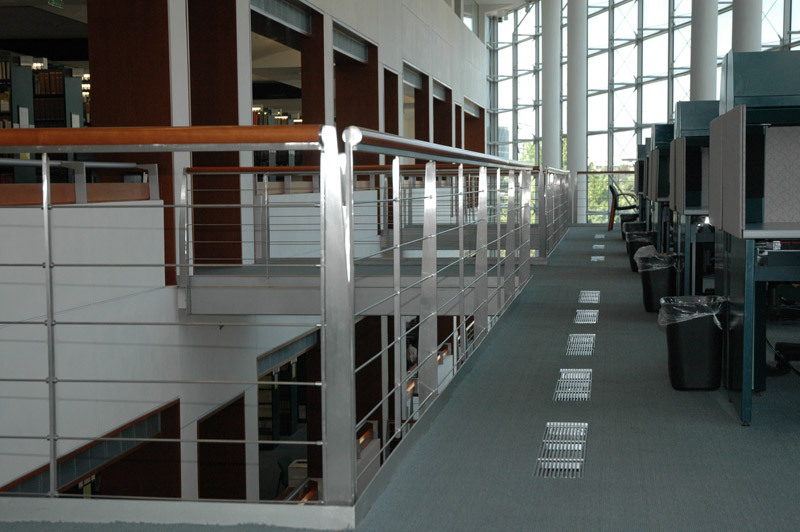 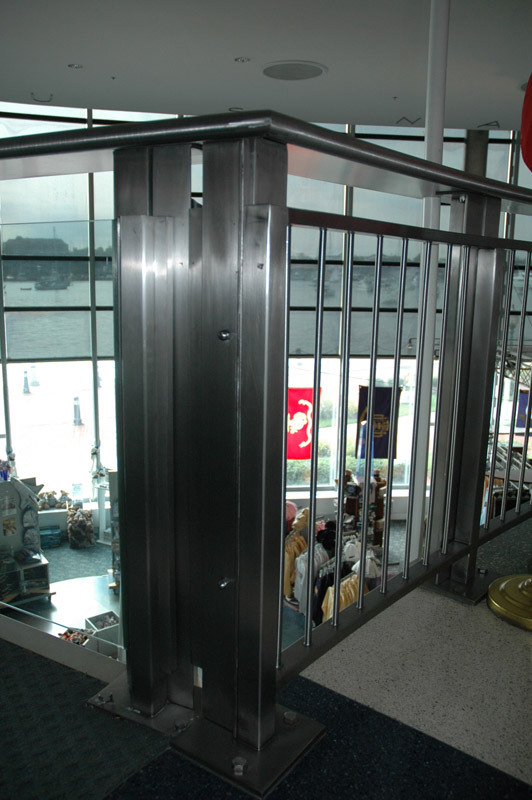 This is an exterior rail system which includes galvanized steel posts with stainless steel cables, galvanized top cap and a stainless steel grab rail. 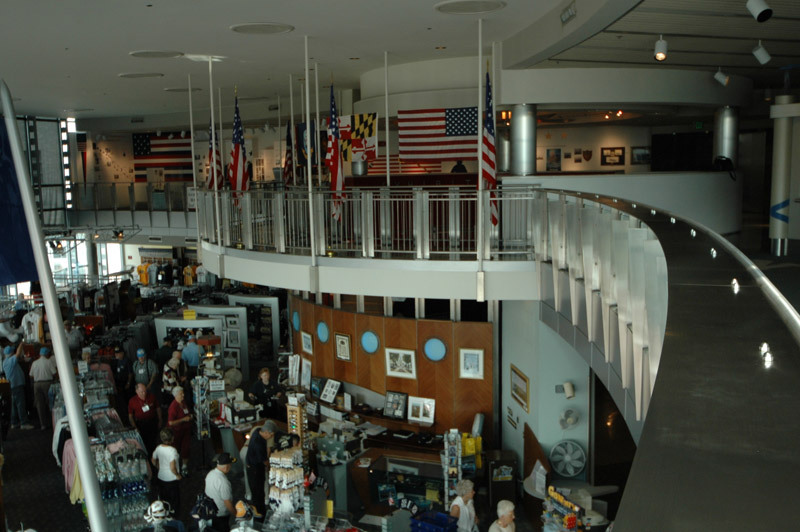 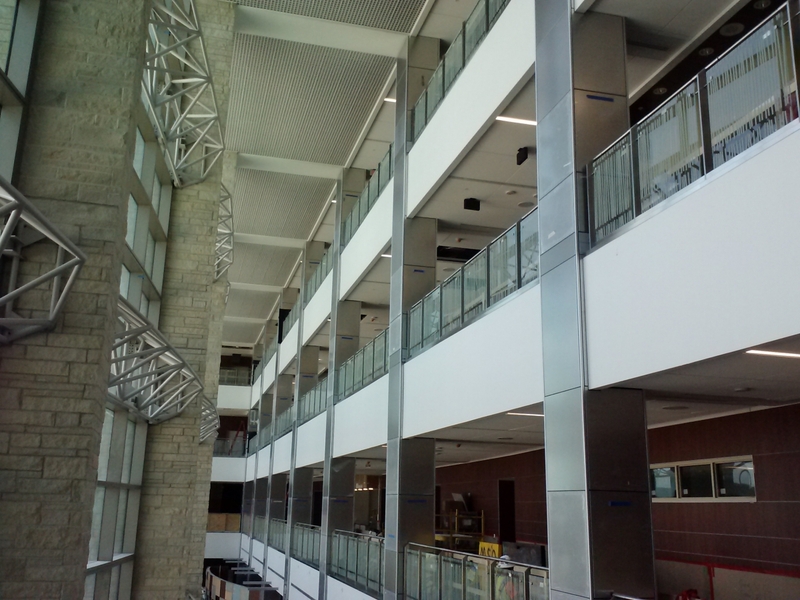 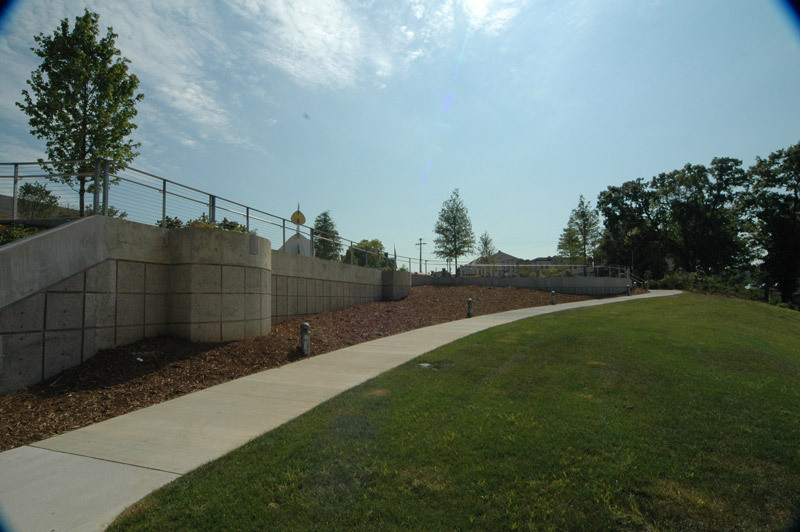 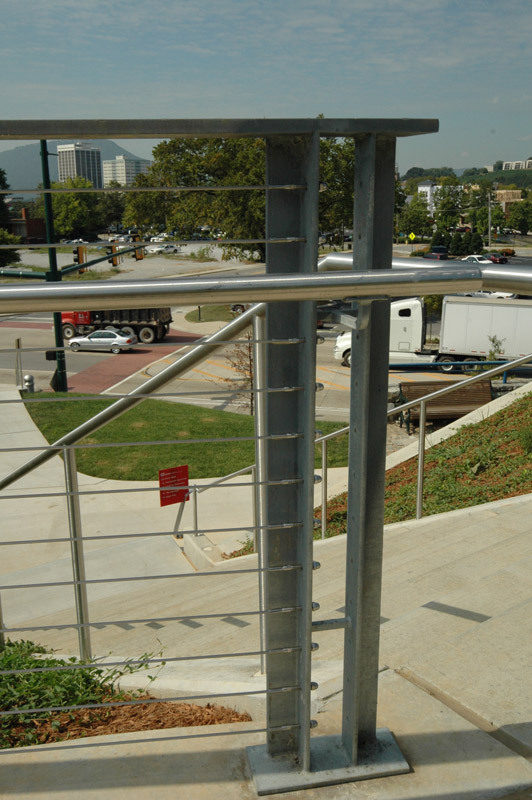 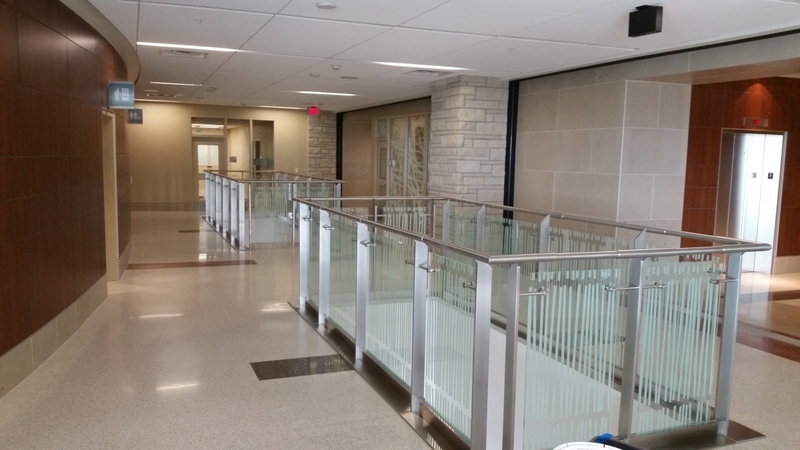 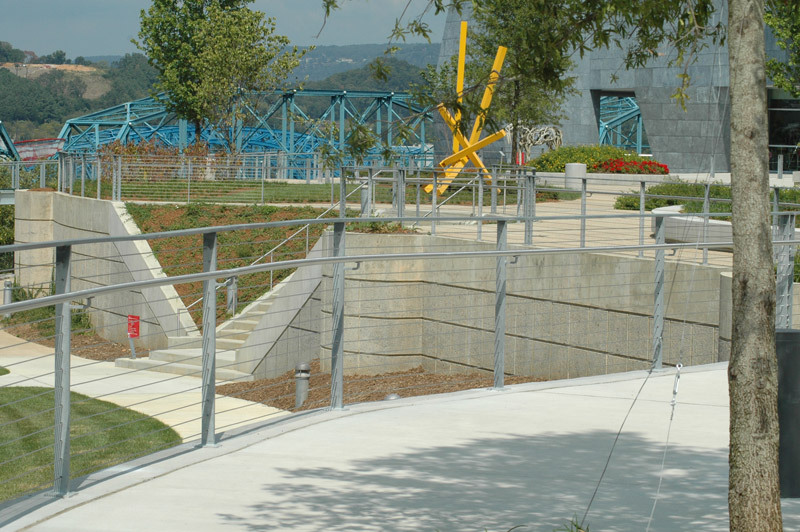 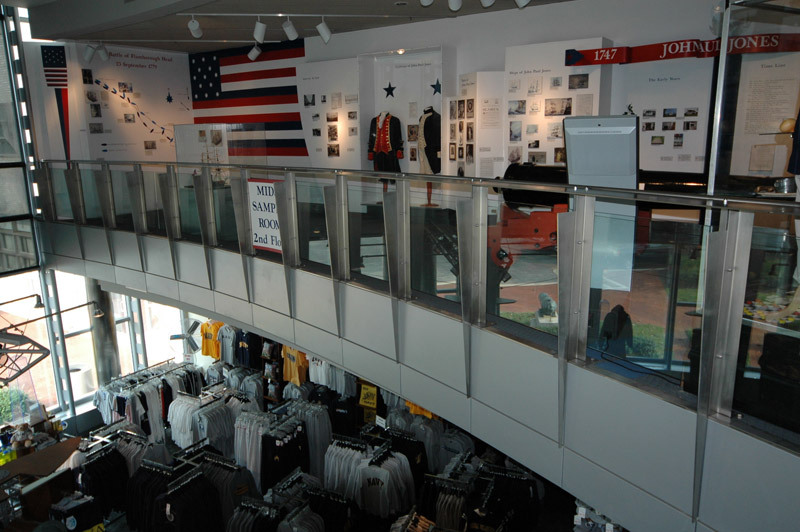 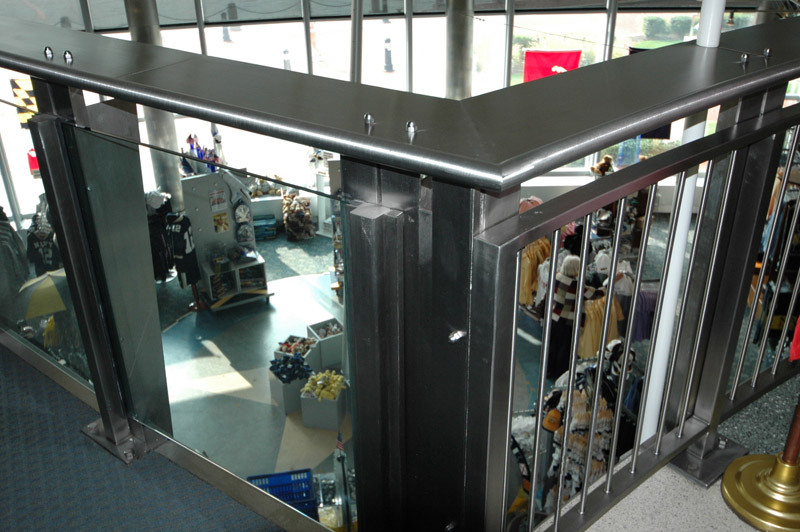 This rail system was mounted on top of a serpentine concrete wall with stainless steel and epoxy fasteners. 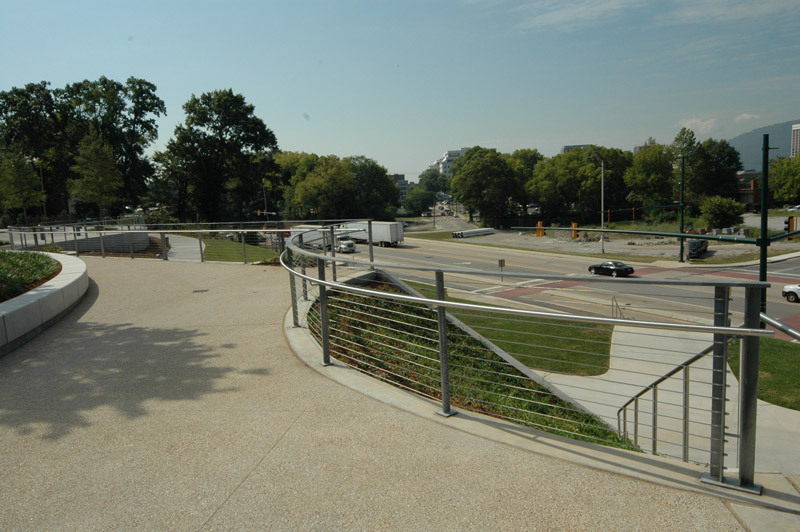 This is a maintenance-free rail system. 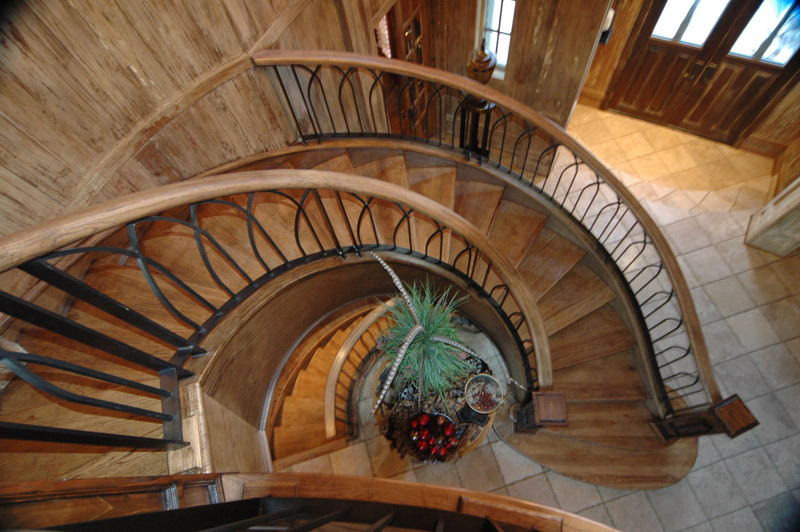 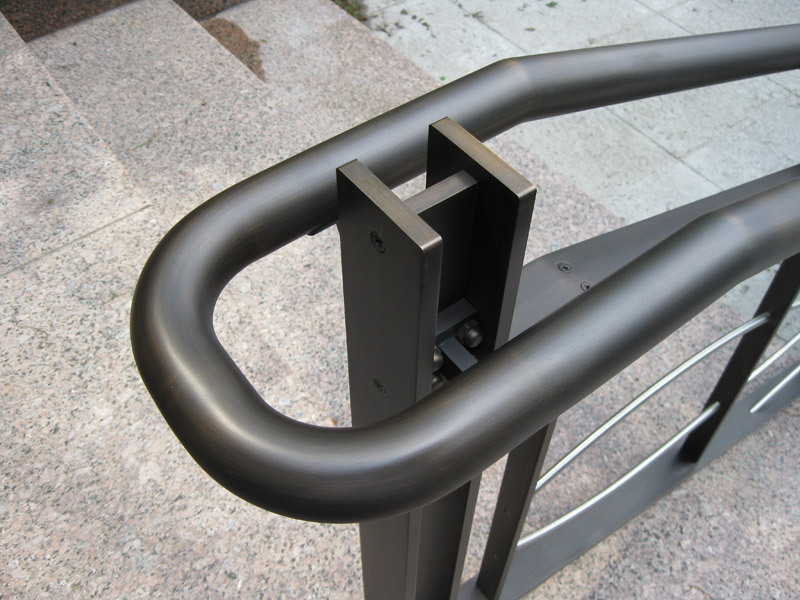 This is an oil-rubbed steel rail system made to look similar to a gun barrel finish. 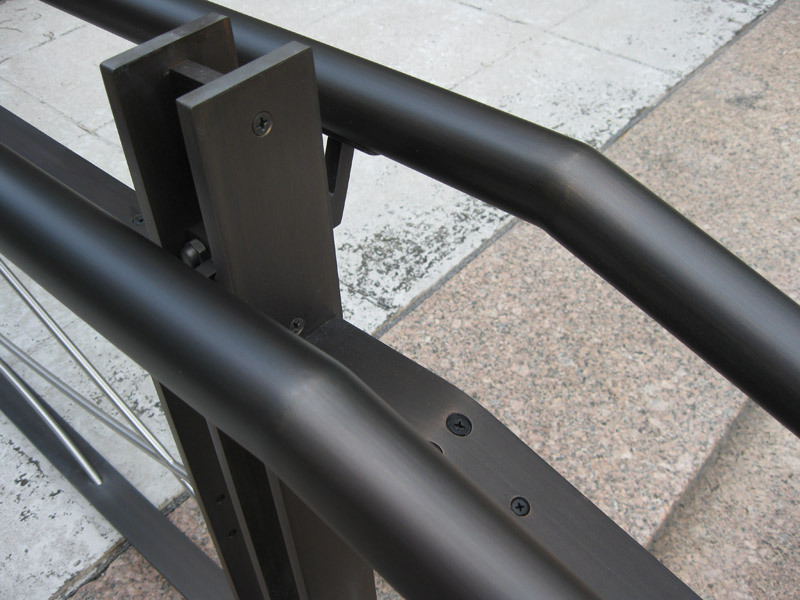 The patina process which gives you the gun barrel look is a very tedious process but gives the presence of oil rubbed bronze. 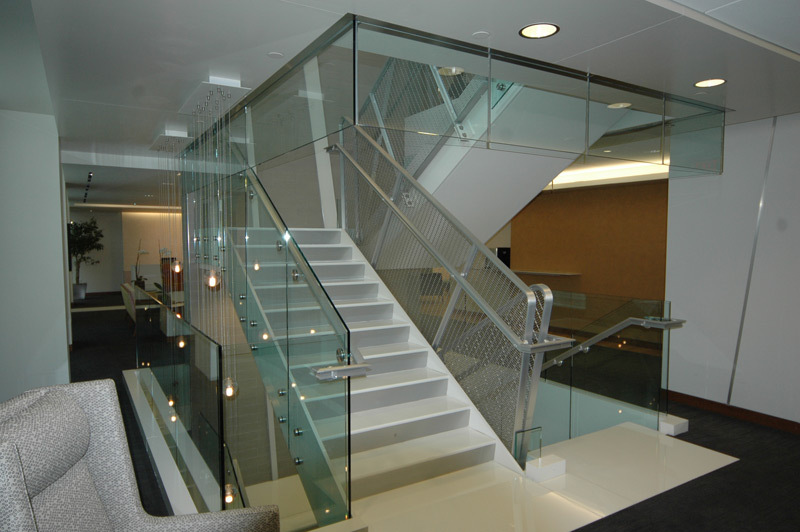 This rail system is complimented with frosted glass suspended in-fill panels, wood newel post and top rail for a very rich and elegant look. 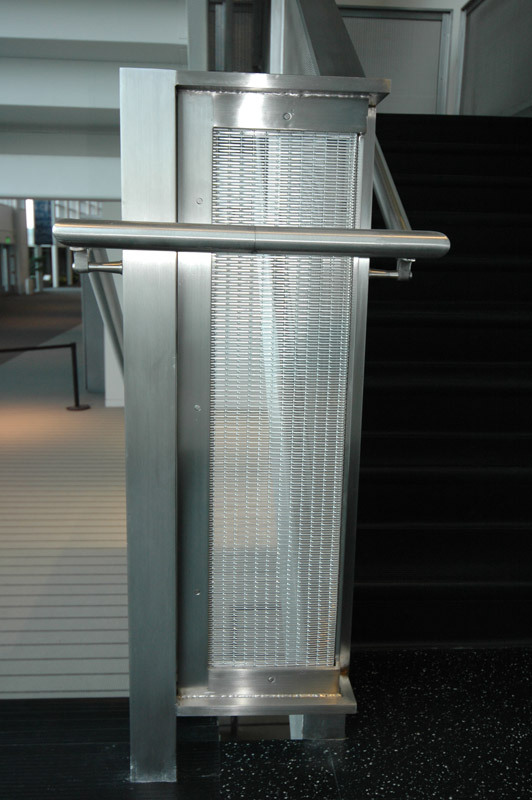 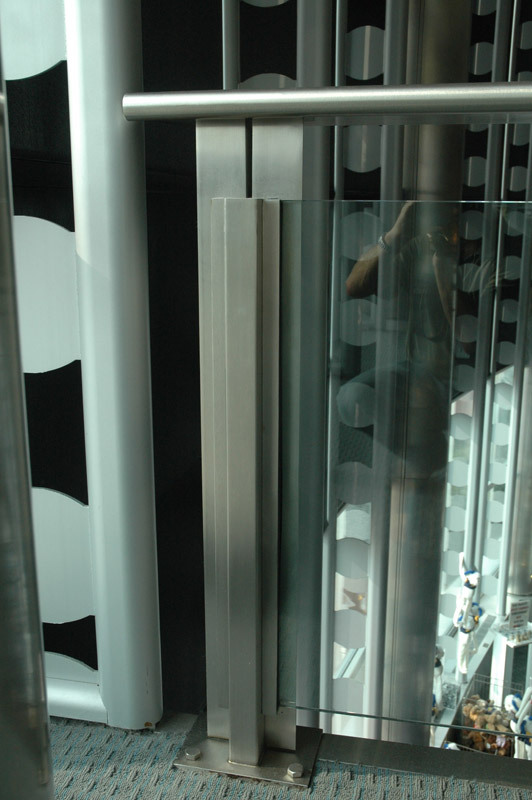 This is a very unique stainless steel structure that incorporates tubular frames with stainless steel picket in-fills as well as glass in-fill panels. 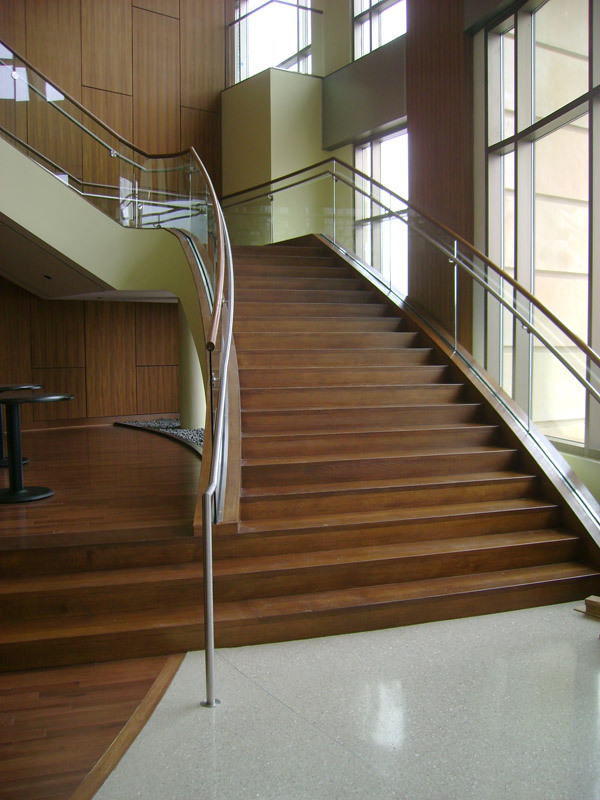 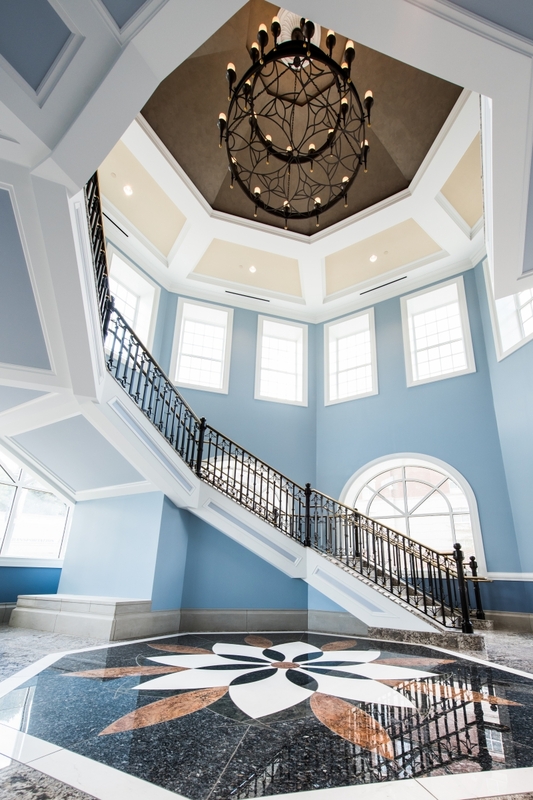 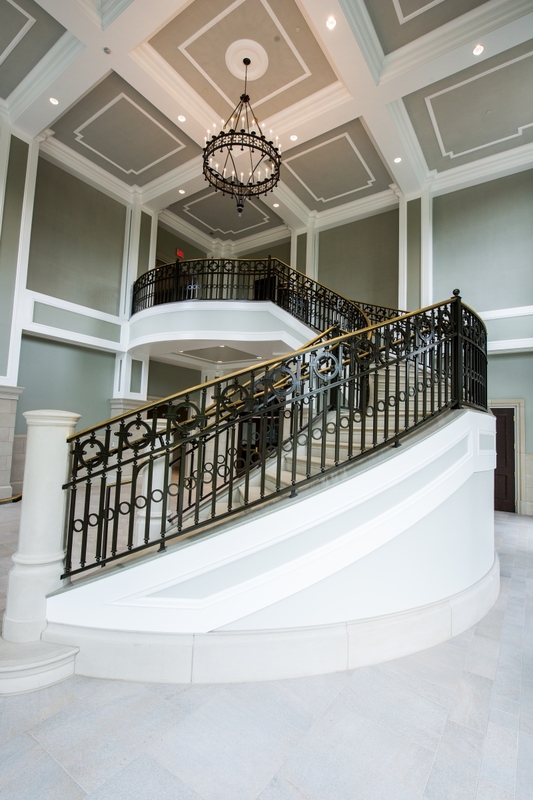 All posts, fins, brackets and top rails are water jet cut and custom fabricated per the architect’s design demonstrating superior attention to detail. 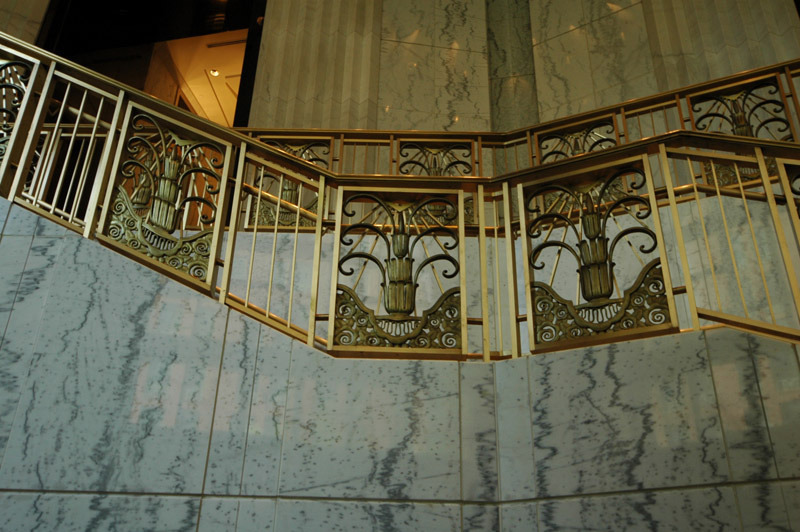 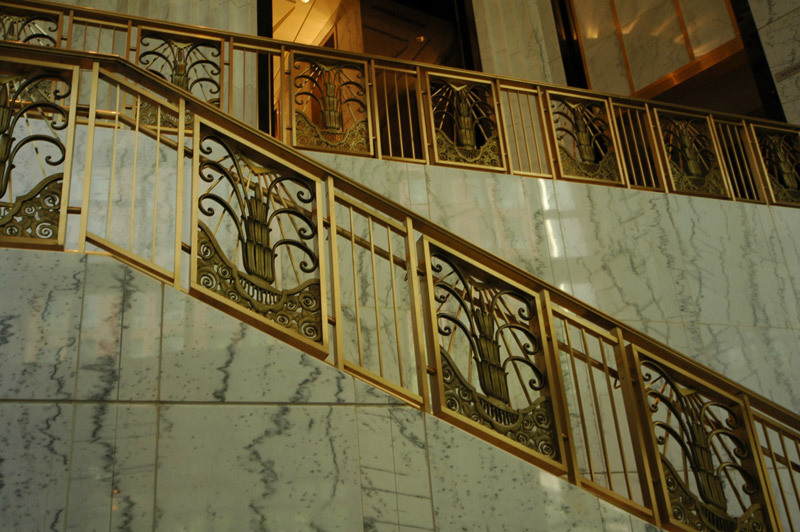 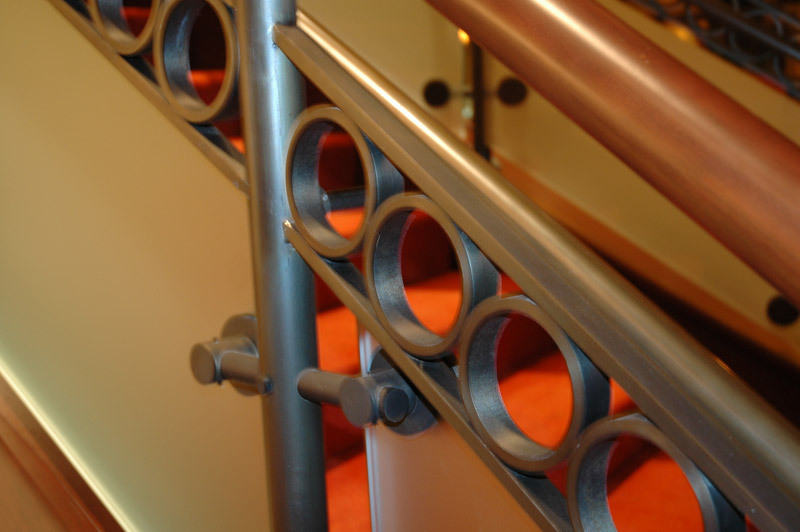 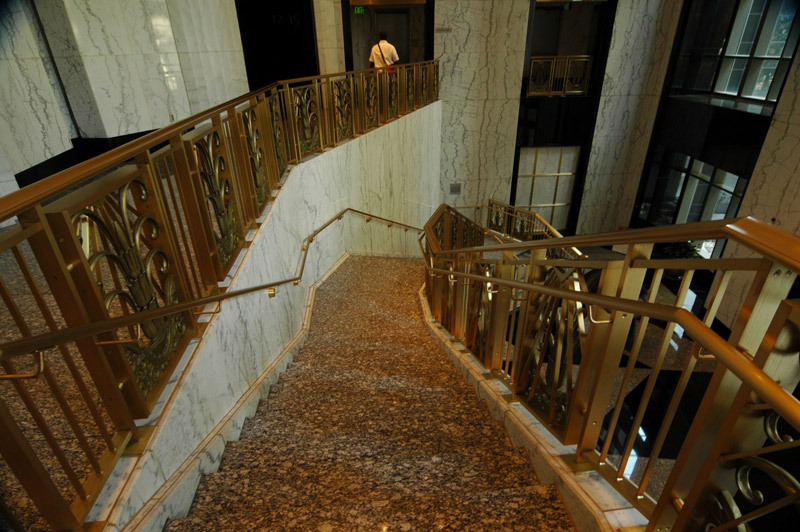 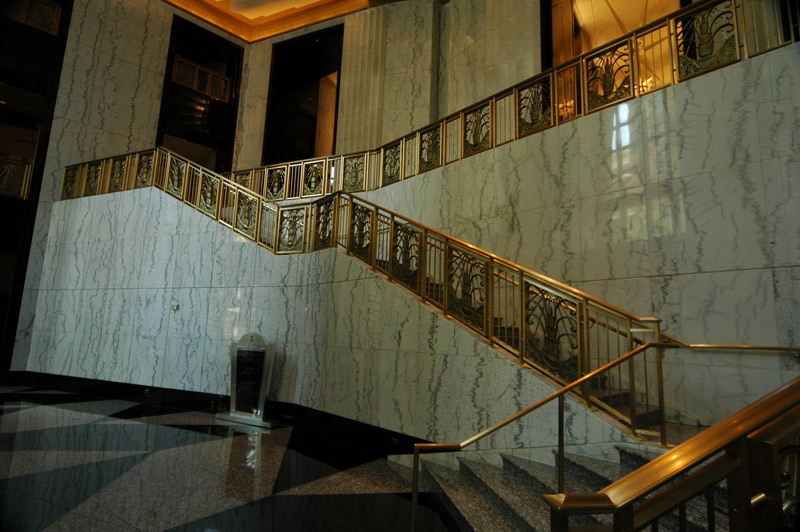 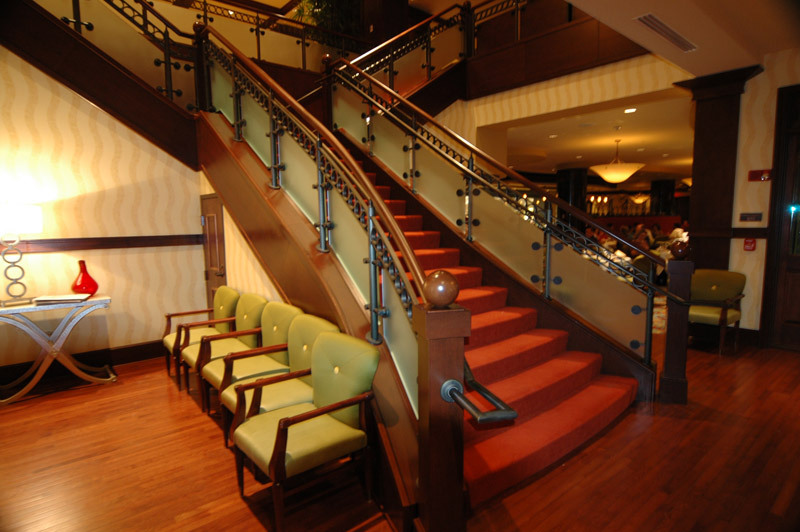 The bronze hand rail system was created using solid bronze and stainless steel, and is oil rubbed giving an aging appearance. 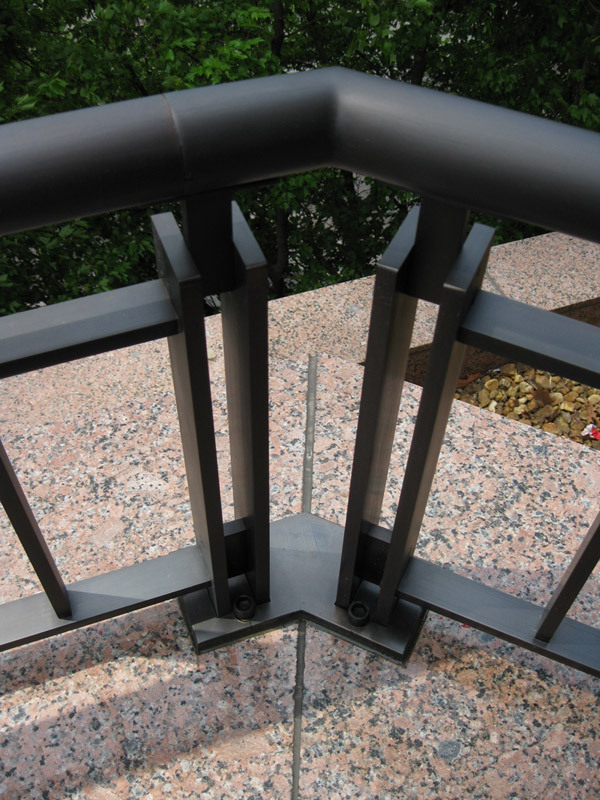 We used a non-ferrous bronze material to ensure the structure will never rust and will always be maintenance free. 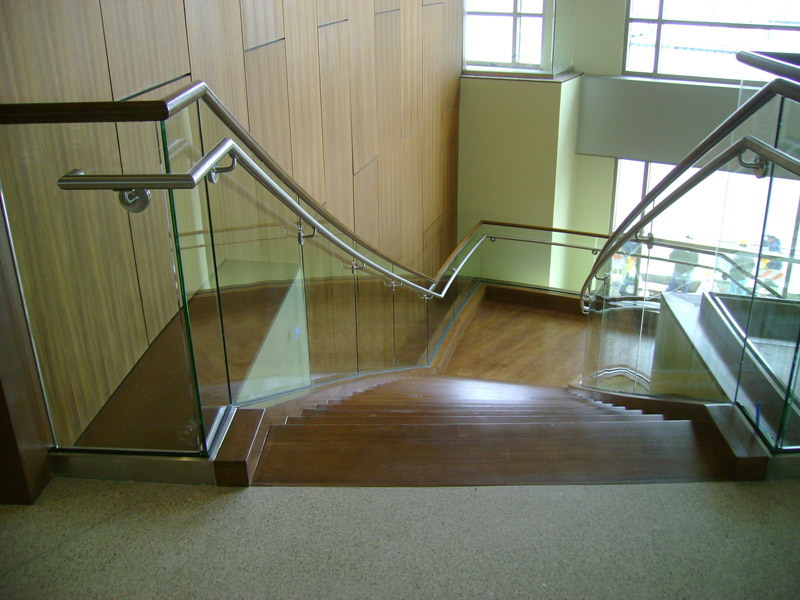 This project used several different rail designs. 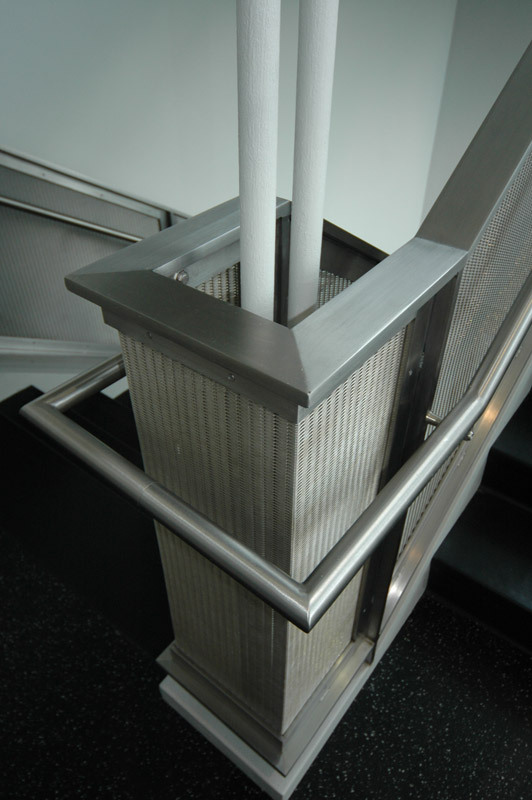 The most challenging was the stainless steel post and flat bar top cap with a stainless steel bar and GKD wire fabric in-fill panel system attaching two pieces of angle around the fabric to hold it in place.